Possibly the most #ironic thing in the history of the world is also about iron. Just how ironic is that? I am most delighted that the esteemed HealthWatch organisation, which is an independent charity for science and integrity in medicine, invited me to write an article on the myth that was first bust here on BestThinking, and has since been read by over 50,000 people. My HealthWatch article can be read here (Sutton 2016) . 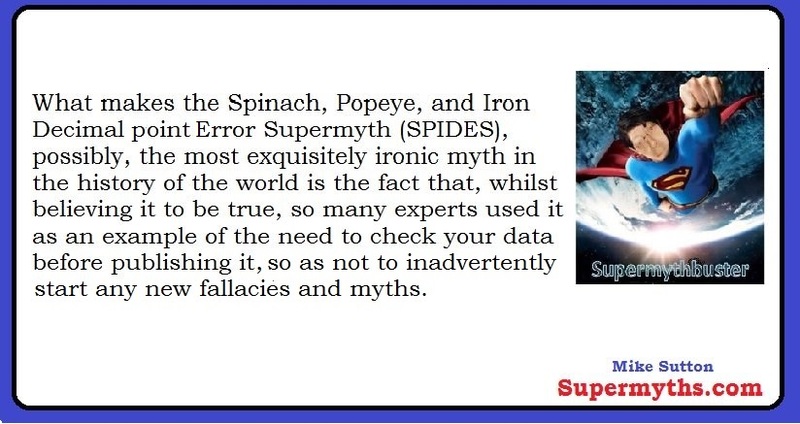 I am hoping now to spread the word further about the SPIDES supermyth, in the hope – and it is only hope – because we can only hope without further research into what works in nutritional attitude change that my attempts will not back-fire and make things worse – that the humour and the irony of it all will help people make informed nutritional choices about iron. I wonder, Will Professor Steve Jones (FRS) now be “knowledge contaminated” about Supermyths ? There has been a “state of denial” canny indifference amongst most of the World’s top Darwin scholars to the Supermyth busting “New Data” facts (e.g.Sutton 2016 ), which puncture the premise underpinning the old Darwinist paradigm of tri-independent discovery of Matthew’s prior-published original conception of macroevolution by natural selection. I wonder, now, will the leading Darwinist Professor Steve Jones (FRS) be “knowledge contaminated” on the topic of Supermyths and Charles Darwin – given that he is a notable patron of HealthWatch, which introduces the supermyth concept in its quarterly newsletter (newsletter 101) this month and given that ,along with Dr Mike Weale, last year revealing – most unfortunately for the veracious history of scientific discovery – just how little he and Weale understood – or cared to share with the public – about 100 per cent proven prior-readership of Patrick Matthew’s original conception of macroevolution by natural selection by Darwin’s and Wallace’s associates, influencers and their influencer’s influencers and Darwin’s 100 per cent proven lies on that very topic (see Sutton 2014 for the Darwin and Wallace Immaculate Conception Supermyth bust). Interestingly, Dr Mike Weale – Professor Stephen Jones’s Radio 4 Patrick Matthew and Charles Darwin programme associate – is well aware of my work on supermyths. WhenWeale publically accused me on his website of creating my own supermyth on the story of Darwin, Wallace, and Matthew and the history of discovery of natural selection I sent him a published challenge to debate the issue with me in any prestigious university setting of his choice, time and place, with as many supporters as he needed, before an academic audience and on camera. Despite several attempts to get him to change his mind, Weale refused on the stated grounds that he feared I would mock him and “sling mud” at him for the world to see. See my recent article on the de facto “MacDarwin Industry” regarding how Dr Mike Weale’s unevidenced accusation, and refusal to defend it in public, on camera, can be understood in context of wider pseudo scholarly Darwin scholar uncomfortable “New data” fact denial behaviour. Moreover, even Wikipedia editors are systematically deleting the facts of the published historical record on this topic and pretending to the public that they do not exist. See how I caught them in an online public encyclopedia fraud sting operation – here.